In Colorooh you’re supposed to do one thing and one thing only, help match them with their colors and positions. The game is as simple as it gets but there are different environments and worlds to discover as you progress through the game. 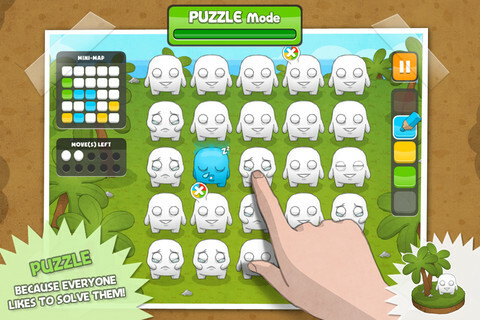 The game is made up of four different game modes that are all unique in their own way. There is literally no story for the game and that is perfectly okay because the game doesn’t even need one. With its numerous amount of levels and the ever increasing difficulty, you focus more on the gameplay and less on the fact that there is no story. This being said, if they wanted to add a small bit of information as an extra if they truly felt the urge to. 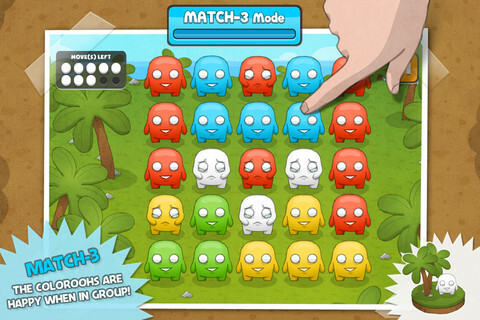 The game is set into four different modes and each of those modes have their own special way to play the game. The first game mode is match 3-mode. In this mode, your goal is to match all the different color blocks with their proper matching color. The first three level are pretty easy but, that third level will be the final simple level in the game. After that, the puzzles get more and more challenging and you will have to begin to think really far outside the box in order to solve each puzzle. The next game mode is Shift mode. In this mode, you are given a mini-map which tells you where all of the blocks are supposed to go. The whole game mode is technically just organizing the blocks in a certain way but you get to see some interesting formations which will make you want to continue playing the game mode. Next on the list is Puzzle mode. This mode is the hardest one to get used to. You have to paint each one and then make sure that you have all of them set up correctly also. There is a problem with this mode because you have a very limited amount of tries so you will sometimes be stuck on a level for ten minutes (in my case). 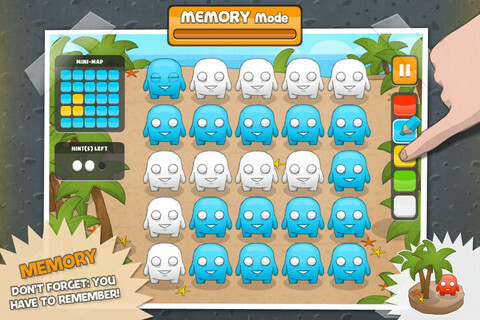 The last mode in the game is called Memory mode and it also involves painting the white one but it comes with a twist. Yes, you may get a certain amount of tries but, once you color one though, you no longer get to use the mini-map they give you. This mode is one of the best in the game because it was fun testing how my memory was. The games visuals are very bright and colorful and this just doesn’t go for the colors you use to play the game. The backgrounds of the game itself usually uses brighter colors whether it be the green used on the trees or the red used to help color the lava. There is also no lag time when playing the game and I have yet to experience one glitch. The game plays absolutely perfectly and it is completely clean and crisp. In other words, it is graphically perfect. The game has a witty audio track when the game first starts and it fits the environments the game has which overall is fun and witty. The game features brilliant sound effects whether it be clicking a menu icon or switching the colors around. I enjoyed hearing them because every time I clicked a button I heard something that sounded like I was leveling up of some sort but it was just the menu which was perfectly okay with me! Overall, Colorooh is a great game all around. With its outstanding and numerous levels, brilliant graphics, and wonderful sound effects, it is definitely hard to find anything wrong with this game. Maybe this game could turn into a franchise like oh so many games do on iOS but, until then we can just hope for game updates adding new levels for us to play.